This weekly podcast is full of quick takeaways! 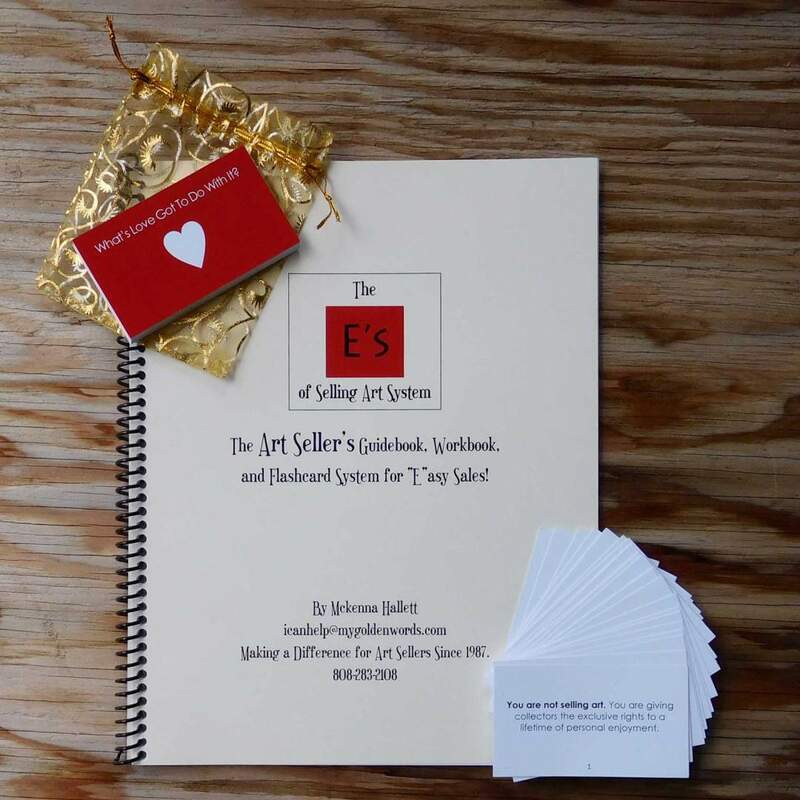 At about 12 minutes each, they are based on the principles of the “E’s of Selling Guidebook”. They will deeply impact anyone who sells their art directly to the public at art fairs, open studios, and even online. What they don’t know will hurt you. It’s invaluable to make sure you understand all the value you have to offer your potential collectors. If you are not communicating every single bit of the value of ownership, you might be losing sales that you didn’t know you’re missing. While the episode is short, the lessons here could last a lifetime if you take the challenge. The “daily practice” suggested in this podcast is potent. People need to hear your story, but not for the reasons you might be assuming. In this episode, we will explore the story behind the story and what you need to do to Find Loving Homes for Your Art. This podcast might bring you closer to success in many different areas of your life. The less you use these words, the more others will trust you and engage with you. They have the same impact on everyone. Yep…even YOU! This is fourteen minutes of listening that might just bring you more sales instantly at your art shows. I know it seems counter-intuitive, but you need to hear me out on this! This is a game changer. This is likely one of the more important principles that any artist who is in the public and sharing their art will need to know. In this podcast, I take you through some significant emotions. Not as wild as the last episode! But for best results, you might want to listen to 12 again before you listen to this one. This episode is chock-o-block full of good solid ideas for success. We ended up chatting about many important art business best practices, but Rebecca saved the best for last. You will have a lot to consider when this episode concludes! I know the goal of a podcast is to listen while you work, walk, or whatever. This podcast will probably stop you in your tracks. Be prepared to even get quite worked up about this one. In a good way. You might be losing sales before you even have a chance to greet visitors of your art. While there can be controversy around this practice, I hope you will keep an open mind and heart and hear me out!